The Battle of Talikota which happened in Dakshin Bharat during the 16th century is more commonly cited as the reason for the collapse of Vijayanagara empire which served as the greatest defender of Dharma during islamic invasions. The battle which seemed to be resulting in an easy victory of the Vijayanagara armies led by Aliya Rama Raya ended as a disaster for the empire as a result of a cruel betrayal by Islamic mercenaries from other nations who fought on the behalf of the empire. Rama Raya and his younger brother Tirumala Deva Raya were sons-in-law of the great Vijayanagara emperor Krishna Deva Raya. Along with their brother Venkatadri, the Aravidu brothers rose to prominence during the rule of Krishna Deva Raya. Rama Raya was a prosperous army general, able administrator and tactful diplomat who conducted many victorious campaigns during the rule of Krishna Deva Raya. After the demise of his father-in-law, as a member of the family, Rama Raya began to wield great influence over the affairs of the state. Krishna Deva Raya was succeeded in 1529 by his younger brother Achyuta Deva Raya, upon whose demise in 1542, the throne devolved upon his nephew Sadashiva Raya, then a minor. Rama Raya appointed himself regent during the minority of Sadashiva Raya. During this time he became virtual ruler, having confined Sadashiva Raya. Rama Raya removed many loyal servants of the kingdom and replaced them with officers who were allegiant to him. He also appointed two Muslim commanders, the Gilani brothers who were earlier in the service of the Sultan Adil Shah as commanders in his army, a mistake that would cost the empire in the Battle of Talikota. During his rule, the Deccan Sultanates were constantly involved in internal fights and requested Rama Raya on more than one occasion to act as a mediator, enabling Rama Raya to push north of river Krishna and expand his domains utilizing the disunity of the Deccan Sultans. These strategical tactics and able leadership made Vijayanagara empire reach its pinnacle during the rule of Rama Raya and thus making him the first Vijayanagara emperor to rule the banks of river Godavari. This prominent rise of Vijayanagara empire under Rama Raya by taking the opportunities presented because of the lack of unity among Deccan sultans made them plan a war on the empire together with their full strength. Rama Raya on getting the news of this situation and being an able general decided to avoid waiting for the sultans near his borders, selected a buffer territory for the war which resulted in the Battle of Talikota. By 29 December 1564 the first battles broke out. Qutb Shah and Nizam Shah, who were friends, decided to go on their own first and led their divisions to clash with the division of Tirumala Raya. The Dharmic forces inflicted defeat on the Muslims and the Sultans fled in disarray losing thousands of men in the encounter. The Sultans were shaken by this encounter and asked Adil Shah to stand by them for the intended Hindu counter-attack. Nizam Shah and Qutb Shah decided to parley with the Raya who was now orchestrating a large counter-thrust into the Muslim flanks. At the same time Adil Shah sent a mendacious message to the Hindu commander that he wished to remain neutral. As a result of these parleys Rama Raya delayed his counter-thrust giving a minute but critical time window for the Muslims to regroup. Sultan Imad Shah of Berar made the first thrust by assailing the division of Tirumala Raya sentineling the Krishna ford. Tirumala fell upon him with his full force and in a short but excruciating encounter destroyed the Sultan’s army and sent him fleeing for life. However, the sultans Nizam Shah, Qutb Shah, Barid Shah on one side and Adil Shah on the other used this distraction to cross the Krishna and attack the main divisions of Dharmic forces. Rama Raya, though surprised, rapidly responded. Despite being in his 70s he decided to personally lead the Dharmic forces and took to the field in the center. He was faced by the division of Nizam Shah. Tirumala hurriedly returned to compose the left wing of the Dharmic forces that was contravened by Adil Shah and the Hindus under the Maratha chief Raja Ghorpade, who were then under the Sultan of Bijapur. Venkatadri formed the right wing that was opposed by Qutb Shah and Barid Shah, fortified by Nizam Shahs auxiliaries as the battle progressed. On 23 Jan 1565, the armies clashed on the plains of Western Ghats. Venkatadri struck early and within the first two hours the Hindu right wing`s heavy guns fired constantly on the ranks of Barid Shah. As the ranks were intenerated, the Hindu infantry under Venkatadri ploughed through the divisions of Barid Shah annihilating them. The assault was so vigorous that it looked as though a Hindu victory was imminent. Qutb Shah was also in retreat, when Nizam Shah sent his forces to shore up the ranks of the Sultans. Nizam Shah himself was then pressed hard by the heavy cannonade from Rama Raya`s division and was facing a Hindu infantry thrust with Rama Raya at the helm. At this point, the Sultans signaled to the Muslim officers in the Vijayanagara army to launch a subversive attack. Suddenly Rama Raya found his rear formations was attacked by the two Muslim divisions under Gilani brothers in his ranks. About 140,000 Muslim troops had opened a vigorous rear attack on the Dharmic forces and captured several artillery positions. Several cannon shells landed near Rama Raya’s elephant and he fell from it as his elephant was struck by a cannon shard. Rama Raya tried to recover but Nizam Shah made a dash to seize him. When Nizam Shah asked Rama Raya to accept Islam if he wished to be spared alive, he uttered the words “Narayana Krishna Bhagavantha” meaning “Narayana and Krishna are his gods” after which he was beheaded by the Sultan. Venkatadri was also killed as the Qutb Shah, Nizam and Barid put all their forces together and launched a concerted punch. Tirumala tried to stiffen the center but at that point the whole division of Adil Shah that was waiting all the while made the final assault on the rear of Tirumala Deva Raya’s division. The Vijayanagar artillery had by then been exhausted and was blasted by the Adil Shahs artillery and the Dharmic forces faced a rout. Tirumala Deva Raya, seeing the rout, fled to Vijayanagara and taking up the treasury on 1500 elephants fled south towards Penukonda. 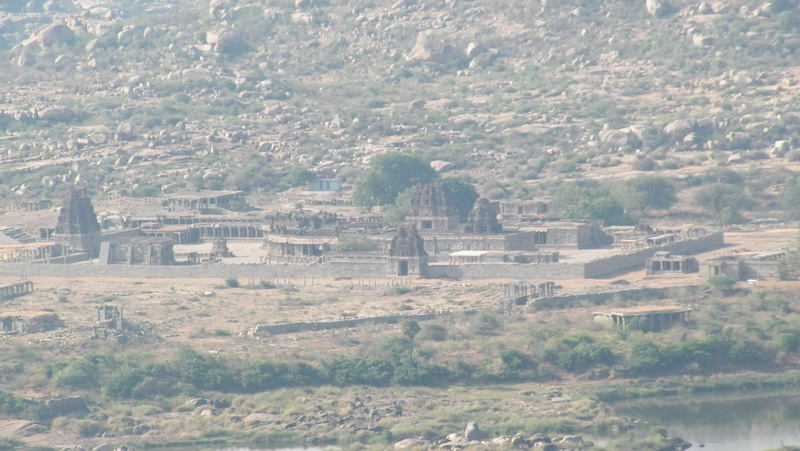 Thus, the Battle of Talikota which is believed as the major reason for the collapse of the majestic empire of Vijayanagara was because of the huge betrayal in the name of Islam, the intolerance of which can still be witnessed after 450 years in the ruins of the city at Hampi.